Many florists have asked, "how they can we deliver more orders per trip?" Simply put: our Business Managment System Delivery Management app, powered by Route4Me. Not only is this tool is designed to reduce your route planning time, but it also allows you to deliver to more customers in a shorter amount of time and provide real time status updates! Save time, gas, and money while decreasing your environmental footprint with this app! Instantly, the route is then sent to the driver's mobile device and they are on their way! 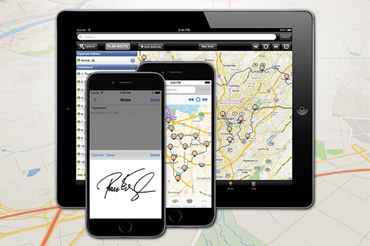 This easy-to-use Route4Me mobile app is designed to be intuitive and user friendly. Route4Me and BMS are fully integrated, which means drivers are immediately notified of any changes you make back at the shop. Plus, you can also see any modification your driver may make, including a different address or notes to the order, keeping everyone in the loop.